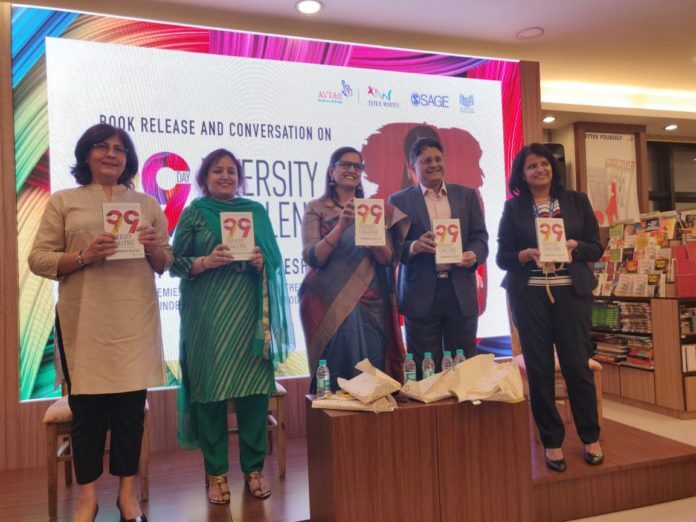 Mumbai: India’s first ever book on Diversity & Inclusion – The 99 Day Diversity Challenge authored by country’s celebrated D&I expert Dr. Saundarya Rajesh was launched in the city today. The book was unveiled by Milind Sarwate, Founder & CEO – Increate Value Advisors in the presence of Mahalakshmi R, Head HR India – Mondelez International, Madhavi Lall, Managing Director Head HR India, Deutsche Bank and Smriti Ahuja, Diversity and Inclusion Head – India, Cognizant Technology Solutions. Followed by the launch activity, an intriguing fire side chat moderated by Dr. Saundarya Rajesh was hosted in the evening on the theme ‘MY DIVERSITY STORY’. Sharing insights on the subject, the fire side chat witnessed country’s leading D&I experts engaging in a conversation about the emerging trends in D&I space across companies in India Inc. The candid conversation opened gateways into understanding the role of a leader in cultivating an inclusive culture at workplace. Drawing parallel with the book, the chat also witnessed the exchange of personal encounters and stories that have encouraged dialogues on inclusion at workplace. As India’s first ever guide to implementing D&I culture at workplaces, the book provides a complete, starter-to-desserts detailing of D&I concepts and offers a precise explanation on the different strands of diversity along with the future of D&I thoughts. Written in an engaging, gentle, light-hearted way, Dr Rajesh demystifies the vast subject of Diversity and Inclusion for the business leader, the diversity enthusiast and even the young curious professional. Filled with interesting stories spanning different genres the book sequentially uncovers what Diversity and Inclusion means and how this can be absorbed by just about everyone. Published by SAGE Publications, The 99 Day Diversity Challenge TM is priced at Rs. 495 and is available for pre-order across ecommerce platforms like Flipkart, Amazon, Infibeam and book stores near you.